Regular readers of this blog have probably already figured out that I cook an awful lot of chicken breasts. I really like their versatility and how easy they are to cook. There are almost no end to the different dishes you can get out of them. 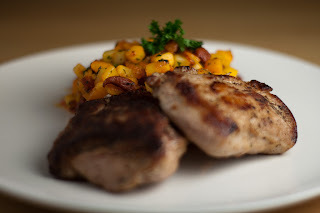 I'm afraid that I far too often that the easy route and use skin and boneless chicken breasts when I cook. This recipe however uses part boned chicken breasts with the skin still on. I must be honest and admit they normally taste more and keep juicier than their stripped cousins. One of the things to think of when cooking this dish is to use a pan that is big enough to fit the chicken breasts and at the same time deep enough so that the lid can go on. I use my 280mm cast iron casserole pot for this. It is about 75mm deep so the lid goes on nicely. There is something that feels right about cooking this with a cast iron pot but you can of course use a normal frying pan with a lid as long as it is big enough. 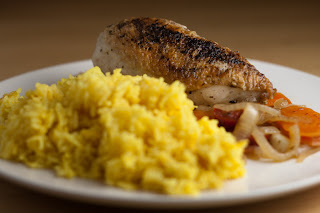 Ok, enough talk about chicken breasts and cast iron casseroles - let's head over to the recipe. Combine the spices into a dryrub. Rub half of the dryrub into the chicken breasts. Heat the oil in a frying pan on a medium heat. Once heated, add in the chicken breasts skin side down and cook until nicely browned on both sides. This should take about 3 - 5 minutes per side. Once browned remove the chickens from the pan. Add the onion and carrots and cook whilst stirring until the onion is browned, somewhere between 5 and 10 minutes. Stir in the garlic, let it cook for about a minute - still stirring. Add the rest of the dryrub, the vinegar, jalapenos, wine and stock. Put the chicken back in, skin side up, and make sure to push it down well in the onions. Bring the mixture to a very gentle simmer. Lid on and keep simmering very, very, gently for about 15 minutes or until the chicken is just cooked. Serve with rice and perhaps some hot sauce on the side. If, against all odds, enough of them should survive until the next meal I quite often use the them to make a cold potato salad. Normally that means freestyling it in a proper way. I take what I got at home and try to mix and match to make some interesting combinations. There isn't really much you can do to ruin a potato salad and the combinations are almost endless. As you'll notice in the recipe below, there are no rules - just mix it together as you feel is right. This time I used crème fraîche but you can just as well use mayonnaise, it's just a matter of what you got at home and what your taste tells you to do. As for the bockwurst, you should be able to find that in most supermarkets these days but replace it with hot dogs or something similar if you feel like it. Mix the dry ingredients in a bowl. Add in enough crème fraîche to coat it all then stir in enough mustard to give it a bit of a kick. Season to taste. I call this fragrant salmon since the spices, especially the coriander seeds, makes the entire kitchen smell so good while you're cooking. Salmon is one of my all time favourites. 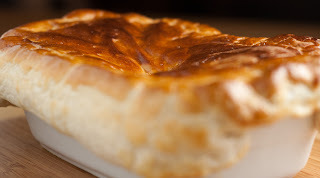 Not only is it very tasty, it is also very versatile and fairly quick to cook. It can be made into a very quick and easy dish or you can spend some time and make something very fancy. This time I just made a quick crunchy salad and had some mini naans with it but you could as well serve this with some wild rice, couscous or whatever takes your fancy. Combine all the ingredients for the salad and let the flavours mingle while you prepare the rest. 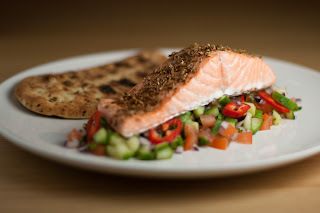 Once the oven is heated drizzle the salmon fillets with the lime juice, rub with the spices and season. Put some oiled tinfoil on a baking tray and put the salmon fillets on that. Cook in the oven for 8 - 10 minutes. Serve with the salad and mini naans. I'm definitely no expert on German food but to me the frikadellen is the German equivalent of hamburgers. Kind of like what us Swedes have in pannbiff and the Danes in their hakkebøfs. 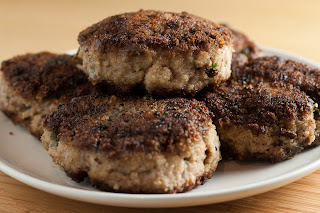 The thing that, to me, differs frikadellen from other hamburger versions are the crispy coating of breadcrumbs. That really sets them off compared to the others. I'm not sure if it is the right way but I use frikadellen both warm and cold. Cold frikadellen makes the start of awesome sandwiches. Add some pickled gherkin slices and strong mustard and you are well on your way to sandwich heaven. Soak the bread in some milk for a couple of minutes. Squeeze out the excess milk. Put the meat in a bowl and mix in the bread, egg, onion, parsley, mustard and marjoram. Season well. Mix all of this together with your hands. With wet hands, mould the mix into palm sized frikadellen that is about 2.5cm thick. Coat all sides of the frikadellen in breadcrumbs. Heat the oil in a pan on medium heat. Fry the frikadellen until cooked through and golden brown, normally about 6 - 8 minutes on each side. As you go along keep the fried frikadellen warm while you finish them all off in the pan. At one stage or another I'm sure that most of us have tried to combine foods that are awesome in their right environment but doesn't go together at all. Ice cream and gravy anyone? This time though I think I hit gold. Two of my favorites, bacon and Sriracha sauce, combined and working beautifully together. 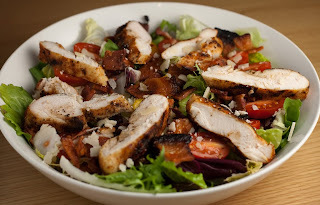 This recipe is for a salad but I can think of quite a few dishes to use it in. Bacon sandwiches with a serious kick being one of them. Come on give it a go, marinate some bacon with Sriracha and cook it in the oven until crispy. Good enough to eat on its own. Just adjust the ingredients in this recipe to fit the amount of people you're serving. Allow at least 1/2 - 1 chicken breast per portion. Just to make sure - no, I have not tried to combine ice cream and gravy. It was just a very bad example. Put the bacon strips in a freezer bag and coat liberally with Sriracha sauce. Make sure to mix well to cover all of the bacon. Let this marinade for at least 30 minutes. In the meantime heat a ridged frying pan until smoking hot. Cook the chicken breasts until done and they have a nice marking from the pan. Remove the breasts from heat and let them cool down. Once the chicken has cooled down, slice it into strips. Line a grill pan with tinfoil and put the bacon on the grill. Cook in the oven until the bacon is crispy, turning half way through. Allow the bacon to cool down and then cut it into pieces. Assemble all the ingredients for the salad in a bowl or on individual plates. No one living in the UK can have missed that we've been having some unusual weather. For those of you not living in the UK - it has been f**cking freezing (for the UK), with lots of snow. Cold weather calls for comforting food and I think this recipe definitively comes in under that heading. It is fairly low on the amount of ingredients as well as the work you need to put in. However, it does take some time to cook so set out in good time. The biggest problem I found with it was that it filled my flat with such nice smells that I wanted to eat it well before it was finished cooking. 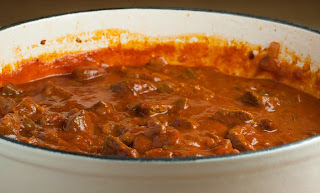 I resisted temptation, this time, and was rewarded with a very tasty stew and really tender meat. As always, freestyle it. Add and subtract spices and vegetables to mix what you got at home. Heat the oil, cumin, chili flakes, and smoked paprika in a cast iron casserole pan or similar on a medium heat. Stir well and let this cook for about a minute. Stir in the pepper and onion. Keep cooking and stirring until the pepper and onion starts to soften. Add in the meat and let it cook until the meat is browned on all sides. Mix in the passata and water, season to taste. Reduce the heat to low and cover the pot with a lid. Let this simmer for about 2 hours or until the meat is very tender. Serve with rice and some white bread to mop up the sauces with. The English title of this recipe is a direct translation of the Swedish one. Another title could have been pasta bake but I kind of like the original title. I consider this dish to be a complete and utter winter classic. With the current state of the weather here in England I started to think about what we used to be fed when I was a kid and we came in for dinner after a day out in the snow. This was one of the first dishes that popped up in my mind. 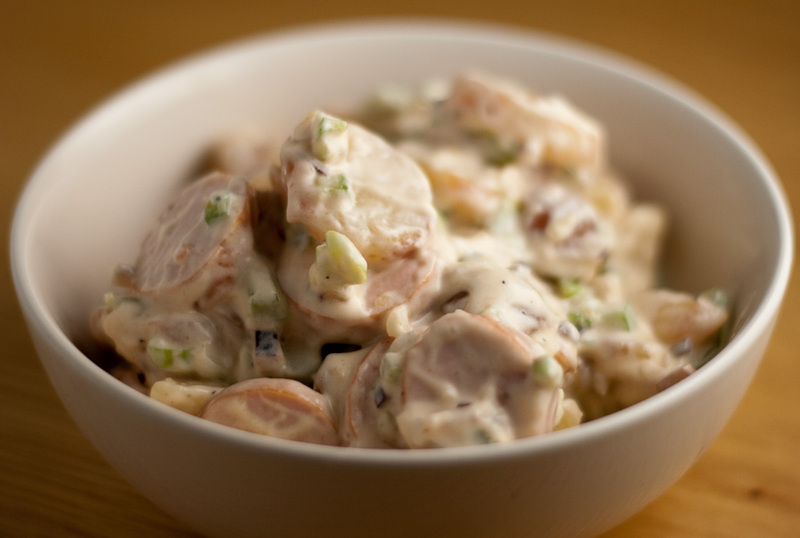 This is a great dish to have in your repertoire. It is quick and easy to make and you can freestyle it quite a bit. If you don't have lardons at home, use some smoked ham or bacon instead for example. If you got some lettuce or ingredients for a salad at home, serve that on the side. You could even make some garlic bread to pad out the meal a bit. One thing, and I know some of you might object to this, that I must have with this dish is tomato ketchup. It just doesn't feel right without a good dollop of Heinz with it. Ok, enough reminiscing about my childhood meals - let's head over to the recipe instead. Linda, from with knife and fork, let me know about a competition for the Ultimate Macaroni and Cheese over at The Cheeselover blog. She said in the comment that she thought I should enter this recipe. Who am I to question her judgement? ;) So consider this entered into the contest. Cook the macaroni as per the instructions on the package. Once cooked, drain and keep on the side. In the meantime heat the oil in a frying pan on a medium heat. Sweat the onions for a couple of minutes before adding the lardons. Let this fry until the lardons are cooked and starting to crisp up. Mix in the macaroni and turn off the heat. 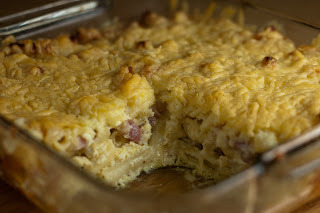 Pour the macaroni and lardon mix into a oven safe casserole dish of a suitable size. Whisk together the milk and egg and season well. Pour this over the macaroni mix and finish off with a good layer of grated cheese. Cook in the oven for 20 - 30 minutes or until the egg-milk mix has set and the cheese turns golden. You can always turn on the grill towards the end of the cooking to brown the cheese some extra.